From the Middle Ages to the present, stories about King Arthur, the brave deeds of the knights of the Round Table, and Merlin's mysterious prophecies have mesmerized readers and audiences. 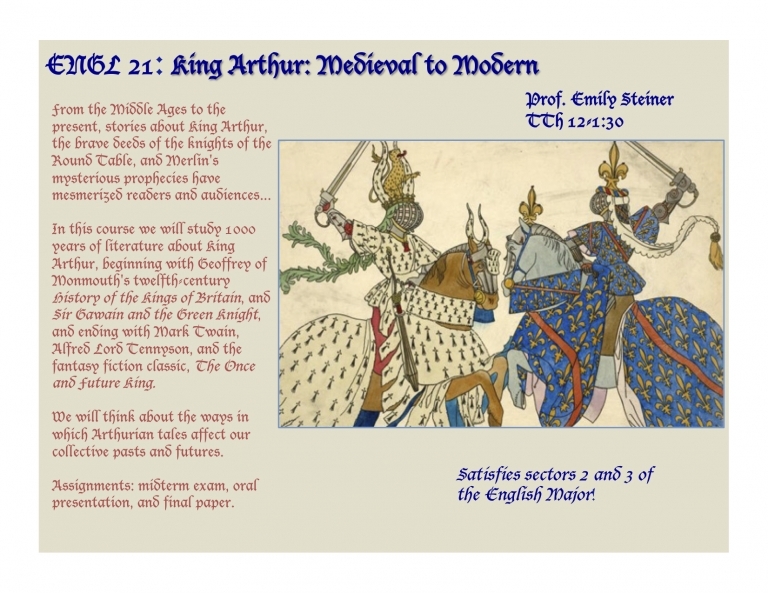 In this course, we will study nearly 1000 years of literature about King Arthur, beginning with Geoffrey of Monmouth's twelfth-century History of the Kings of Britain, and Sir Gawain and the Green Knight, and ending with Mark Twain, Alfred Lord Tennyson, and the fantasy fiction classic, TheOnce and Future King. Throughout the course, we will think about what legends about Arthur mean to the way we write history and the ways in which we view our collective pasts (and futures). Assignments will include response papers, an oral presentation, and a final paper.